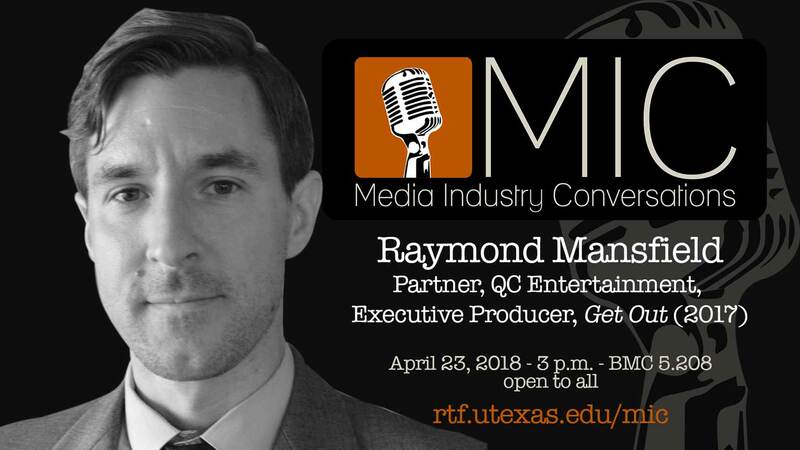 When: Monday, April 23, 2018 - 3-4:15 p.m.
Ray Mansfield (RTF BS, '00) discussed his career trajectory, his roles and responsibilities as Partner for QC Entertainment, and his views on the current state of film financing, production, and distribution. Producer Raymond Mansfield has been integrally involved in film production, as well as production and distribution financing for nearly two decades. Mansfield is a founding partner of QC Entertainment, a company that finances and produces distinct, character-based, director-driven films. A one-stop solution entertainment finance and production company, QC develops, physically produces, finances productions, handles sales and distribution, and everything in between. QC’s recently released films include: Academy Award-winning, box office phenomenon Get Out (2017), the feature directorial debut of Jordan Peele, which was produced for $4.5m and opened as the #1 movie in America (with a 99% positive rating on Rotten Tomatoes) and grossed over $250m worldwide; Zoe Lister- Jones’ directorial debut Band-Aid (2017) starring Lister-Jones, Adam Pally and Fred Armisen, which QC financed, produced and handled sales for the film’s distribution deals with IFC Films for North America and Sony Pictures Worldwide Acquisitions following its Sundance 2017 premiere in the U.S. Dramatic Competition section; Pride And Prejudice And Zombies (2016) written and directed by Burr Steers and starring Lily James, released by Screen Gems in 2016; and Netflix’s A Futile And Stupid Gesture (2018) directed by David Wain and starring Will Forte, Domhnall Gleeson and Joel McHale. Upcoming QC films include: Ike Barinholtz’s directorial debut The Oath starring Barinholtz, Tiffany Haddish and John Cho; Andrew Bowler’s Time Freak starring Asa Butterfield and Sophie Turner, which was adapted from Bowler’s Academy Award-nominated short film of the same name; and Spike Lee’s BlacKKKlansman starring John David Washington and Adam Driver and produced with Focus Features. Prior to QC, Mansfield was Co-President of Movie Package Company (MPC), a packaging/finance/production company with a focus on the business aspects of filmmaking: structuring risk mitigated investment opportunities for financiers interested in entertainment. Over the course of his MPC career, Mansfield raised millions for film “packaging” – development, production and distribution financing – structuring numerous finance models, and negotiating worldwide distribution, intellectual property and above-the-line talent deals. Mansfield’s MPC highlights include: The Messenger (2009) directed by Academy Award-nominee Oren Moverman and starring Academy Award-nominee Woody Harrelson, Ben Foster, Steve Buscemi and Samantha Morton, which received multiple Oscar nominations (including best screenplay and best lead actor); Dog Eat Dog (2016) directed by Paul Schrader and starring Academy Award-winner Nicolas Cage and Academy Award-nominee Willem Dafoe, which closed the Cannes International Film Festival 2016 Director’s Fortnight; And So It Goes (2014) directed by Academy Award-nominee Rob Reiner and starring Academy Award-winners Diane Keaton and Michael Douglas; Kumiko, The Treasure Hunter (2014) directed by David Zellner, co-produced with Academy Award-winner Alexander Payne and starring Academy Award-nominee Rinko Kikuchi, which received multiple independent Spirit Award nominations (including best lead actress and best director); and Powder Blue (2009) starring Academy Award-winner Eddie Redmayne, Academy Award-winner Forest Whitaker and Jessica Biel. Early in his career, Mansfield spent several years working with Bernie Mac while with management/production company 3 Arts Entertainment, where he played a fundamental role in 20th Century Fox’s television series The Bernie Mac Show (2001) and feature films Mr. 3000 (2004) and Guess Who (2005). A New Jersey native, Mansfield grew up outside of Houston and graduated from Kingwood High School. He graduated from the University of Texas at Austin with a degree in Radio-Television-Film in 2000. He currently resides in Los Angeles.